There's something about the screen of the new 10.5” iPad Pro that feels immediately novel but quickly becomes normal, and something that seems obvious at first but reveals itself as a deeper change after a few days. As a heavy user of the 12.9” iPad Pro, I've been pleasantly deceived by this new iPad, and the more I think about it, the more I keep coming back to the display and the story behind its new form factor. I’ve been using the original 12.9” iPad Pro as my primary computer for the past two years. I’ve always seen the large iPad Pro as Apple’s ultimate expression of the iPad’s mission: a large multitouch canvas that can transform into anything you want – a computer that can sit on a desk as a laptop replacement and be carried around without compromise. The 12.9” iPad Pro is the iPad for those who want the power of iOS and the comfort of a notebook. There are iPad users, however, who value the portability of iPads with a smaller footprint even if that results in a more constrained iOS experience. 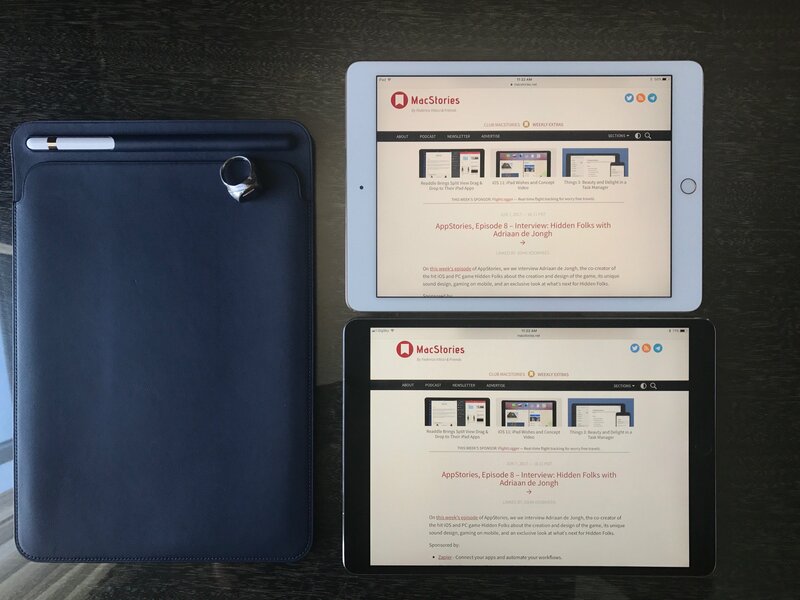 Looking at Apple’s iPad product line, it’s evident that the vast majority of iPad customers prefer compact sizes: while Apple has offered only one option above 10 inches, the iPad mini, iPad Pro 9.7”, and the 2017 iPad were all aimed at users who wouldn’t think twice about throwing an iPad in a bag and who wouldn’t be seriously affected by the reduction in screen real estate. Given the uncertain future of the iPad mini, the 9.7” iPad has become the model for people who want a big-enough screen with extreme portability. To me, this is what makes the introduction of a new iPad screen size so fascinating, for a couple of reasons. First, Apple is tweaking a form factor that is perceived as the ideal one by millions of customers. More importantly, Apple’s latest iPad updates – which also include a spec-bump for the 12.9” model – bring much needed unification to the entire line that was missing since the Air/mini days: all new iPad Pro models carry the same hardware and specs; you just have to pick the size you like. The 10.5” iPad Pro and 12.9” have the same A10X chip, a True Tone display, support for wide color, a second-generation Touch ID sensor, and a four-speaker system. You simply have to choose the kind of iOS experience you’re looking for in an iPad Pro. And as I said above, for nearly two years I’ve relied on the large iPad Pro as my everyday computer for work and pleasure. But since I’ve been curious to live the so-called MultiPad lifestyle, and after Apple provided me with a review unit of the 10.5” iPad Pro last week, I figured I could run an experiment. I set up my favorite apps and workflows from the 12.9” iPad Pro on the new 10.5” model and used it for nearly a week, doing what I usually do on the iPad – which tends to mean all kinds of tasks. To my surprise, while I still prefer longform writing and heavy Split View-driven research on the 12.9” iPad Pro, I’ve enjoyed everything else more on the 10.5” version. A big reason for that, I believe, is the improved display technology and expanded screen size. The first time I swiped on the 10.5” iPad Pro’s 120Hz display last week, I thought it looked fake – like a CGI software sequence. It was incredibly, utterly crisp and fast. It didn’t look like iOS belonged on the screen: after years of iPad usage, my brain was telling me that something didn’t seem normal about the way iOS was animating. Except it’s all real, and it simply takes a couple of days to get used to the new display and the work Apple has put into ProMotion for smoother scrolling and fluid animations throughout the system. A good way to think about the iPad’s new display with ProMotion is not the difference between low-res and Retina screens, but the jump from 30fps to 60fps. You see more of every animation. Text is more legible when you scroll and doesn’t judder. It’s hard to explain and it has to be seen and experienced to be fully understood. Every scroll, page transition, and app launch animation on the 10.5” iPad Pro is absurdly smooth to the point of feeling unrealistic at first – hence the common reaction that something doesn’t quite compute. But as you spend some time with the new iPad and start using it on a daily basis, its display becomes normal and you wish that other Apple displays were the same. I’m not even a week into my tests with the 10.5” iPad Pro, and I think scrolling on my first-gen 12.9” iPad Pro looks choppy now. I’d be surprised if 120Hz displays with ProMotion don’t expand to the iPhone later this year and other Apple computers in the future. The combination of hardware and software really is that good. How Apple has accomplished this is impressive from a technical standpoint. Thanks to better displays and optimizations in iOS, Apple has managed to double the iPad’s display refresh rate. On first-gen Pro models, the display would always refresh at 60Hz but scan for touches at 240Hz when the Pencil was being used, so that drawing with a fine tip on screen could be even smoother and more natural than sketching with a finger.1 On the new generation of iPad Pros, the A10X enables a display refresh rate of 120Hz – a breakthrough in the mobile industry – with the same touch sampling rate of 240Hz when the Pencil is used. In practice, the result is perhaps not as easily explained as the leap from the iPad 2 to the iPad 3’s Retina display, but it’s also not as minor as the difference between regular and True Tone displays. I’d say that ProMotion sits somewhere in the middle between Retina and True Tone in terms of effect on the average iOS experience. I could work on my iPad without high refresh rates, but I don’t want to go back to a display that isn’t as fluid as the one on the 10.5” iPad Pro. Besides the sense of increased responsiveness and improved Pencil performance, the 10.5” iPad Pro’s display simply feels nicer and looks like the future. Once you try an iPad Pro with a 120Hz display, there’s no going back. The 10.5” iPad Pro’s display feels nicer and looks like the future. In addition to ProMotion, the screen’s actual and perceived size plays an essential role in defining this iPad Pro. This isn’t the edge-to-edge iPad that rumors imagined earlier in the year. Apple has taken the same pixel density as the 12.9” iPad Pro (264 ppi – alas, still considerably lower than the iPad mini’s 326 ppi) and introduced a new resolution (2224 x 1668), resulting in a screen size that is nearly 20% bigger than the 9.7” iPad Pro. The 10.5” iPad Pro still has visible bezels, but they’ve been noticeably trimmed down (Apple says by nearly 40% compared to the previous small iPad Pro), especially along the longer sides of the device. In my experience, the display itself feels bigger than it actually is. 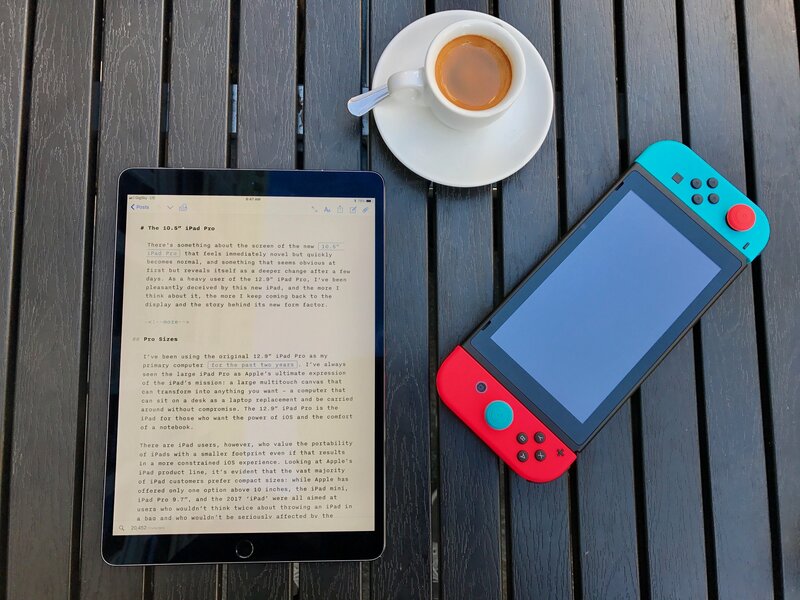 By extending towards the corners of the iPad’s body as much as possible, the display seems to disappear into the bezels, which is particularly apparent when you hold the device in portrait mode to read a book or article in Safari. If you compare a 9.7” to a 10.5” iPad Pro side-by-side, the increase in screen size doesn’t look like a big difference, but everything feels more spacious when you’re holding the new iPad. And because a lot of small-iPad usage tends to happen in portrait as you’re focusing on content, there’s the illusion that your hands are holding a device with no bezels. Once again, it’s hard to describe, and it’s not nearly as impressive when the iPad is docked on a Smart Keyboard in landscape mode, but it feels nicer than the old 9.7” model. I’ve been thinking about why Apple has spent so much time and effort on what is arguably a minor increase over the 9.7” iPad’s screen size, and I believe the answer lies in the exponential response to incremental improvements. At compact sizes, even the smallest tweaks can have a profound impact on the experience. Apple wanted to extract the maximum sense of niceness and spacious UI from a device that could be small enough to carry around, weigh one pound, and still target a different kind of user than the 12.9” iPad Pro. The new 10.5” screen size is a winner, but it’s ProMotion that truly makes it come alive. I was curious to see if the larger screen could make the 10.5” iPad Pro a viable alternative to multitasking on the 12.9” model, but, as I imagined, working with Split View on this iPad is the same as the 9.7” version, showing enlarged iPhone interfaces3 instead of two full-size iPad apps at once. If you were expecting the same Split View experience as the 12.9” iPad Pro, the 10.5” doesn’t allow it. iPad Pro 9.7” (top) and iPad Pro 10.5”. This limitation is mostly due to 12.9” being a bigger jump than 10.5” is from 9.7”, but resolution is also a factor. While some had assumed that Apple would take the same 2732 x 2048 display of the 12.9” iPad Pro and condense it to a smaller size, the company has introduced a new resolution in the iOS device matrix – a decision, I think, made to hit 264ppi on a 10.5” panel while retaining UI elements that are large and comfortable to tap. Cramming the large iPad’s display into this model might have resulted in a richer multitasking experience at an even smaller scale, but I believe touch usability would have suffered. This resolution feels like the optimal one for this screen. 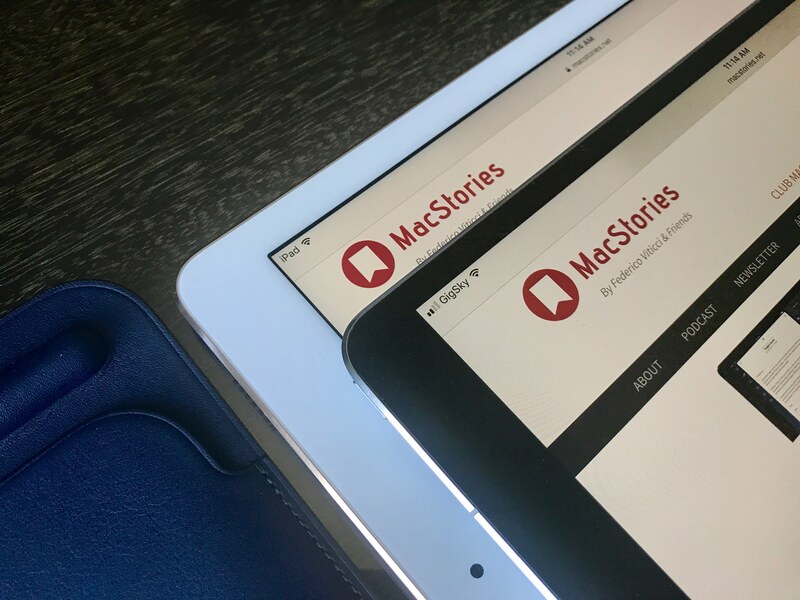 I’ve been testing this iPad doing what I usually do – research for MacStories articles (including my future iOS 11 review), reading in Safari and Twitter, email, and collaboration with multiple apps in Split View, including Working Copy, Slack, and Messages to communicate with other team members. Coming from a 12.9” iPad Pro, multitasking and interacting with two apps at once isn’t as flexible or fast because you’re dealing with compact UIs that have to pack more elements in toolbars at the top and bottom of the screen. 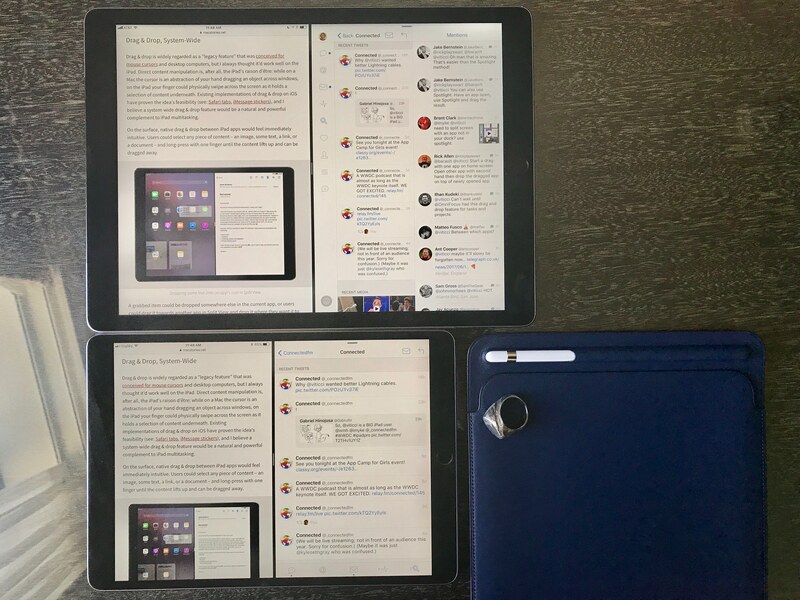 Split View on the first-generation 12.9” iPad Pro and the new 10.5” model. But as a successor to the 9.7” iPad Pro – which I believe will be the common upgrade path for most users – Split View is slightly superior on the 10.5”: essentially, everything’s a bit taller so you can see a couple of extra lines of text when writing or reading without having to scroll. It’s not a dramatic improvement from the old iPad Pro, but if you go back to the first model after trying the 10.5”, you’ll be able to tell the difference. I haven’t tested apps and games that target the A10X in the 10.5” iPad Pro, but overall, the device yields unsurprisingly solid performance, which is a good thing. The original iPad Pro’s hardware has always felt too powerful for the software it was running, and I assume we’ll see more practical gains from the A10X later this year once iOS 11 apps start integrating with frameworks such as drag and drop, Core ML, and ARKit. I’ll be curious to see how running iOS 11 with three apps at once (two in Split View plus floating Slide Over) will perform on the original iPad Pro line compared to the new generation using the A10X and ProMotion. The iPad’s new hardware seems almost underused for now (my 10.5” review unit is running the latest version of iOS 10), but I have a feeling that Apple’s future-proofing strategy will pay off with iOS 11 and beyond. For professional users, where the 10.5” iPad Pro also shines right now is in the slightly-larger software keyboard and Pencil drawing performance. The former is noticeable enough to add up over time and make you prefer the software keyboard of the 10.5” iPad over the 9.7” one. Every key is slightly larger and easier to hit, which doesn’t sound like a big deal until you get used to it and go back to the first-gen iPad Pro’s software keyboard. It’s not as delightfully PC-like as the software keyboard on the 12.9” iPad Pro, but it’s better than before. The Pencil’s performance improvements enabled by ProMotion are real, and we’re getting closer to the point where drawing with a Pencil on screen has almost no perceptible latency and feels like writing with a marker on glass. As I’ve written before, I don’t use the Pencil much for actual drawing because I’m not an artist, but I’ve started to enjoy the simple act of handwriting and taking notes in apps like Notability and GoodNotes. I find it relaxing and I like how the Pencil forces me to slow down and think more deeply about the words I’m typing on screen. With the 10.5” iPad Pro, I’m probably not going to benefit from the low latency and smoother ink engine as much as artists and other creative pros will, but I’ve noticed that even adding basic annotations and text comments is more fluid and responsive than it used to be, which is something I can appreciate. Looking ahead at the changes coming to Notes with iOS 11, I suspect I’ll end up using the Pencil regularly for research and brainstorming. If you use the Pencil a lot, the combination of a lighter iPad with a bigger screen and higher refresh rate is a strong argument in favor of the 10.5” iPad Pro. Alongside a review unit of the iPad Pro, Apple provided me with a Pencil, a Smart Keyboard, and one of the new leather sleeves that can hold both the iPad and Pencil to be carried around together. For the Pencil and Smart Keyboard, you can refer to my original review of both accessories from November 2015 as neither sports major changes at this point. The new iPad Pro 10.5” Smart Keyboard. The Smart Keyboard is slightly larger than the old version for the 9.7” iPad Pro, which should be a welcome improvement for existing users, but my overall stance hasn’t changed. My hands are too big for the Smart Keyboard, which I only use if I’m traveling and don’t have enough space to prop up my iPad on a Canopy and type with an Apple Magic Keyboard. My ideal iPad keyboard setup would be a Smart Cover combined with a backlit Magic Keyboard; unfortunately, that still doesn’t exist. If you liked the Smart Keyboard before, you’ll like this one as well. The materials are the same, the key travel is the same, and it still pairs using the Smart Connector, which is a nicer experience than Bluetooth. 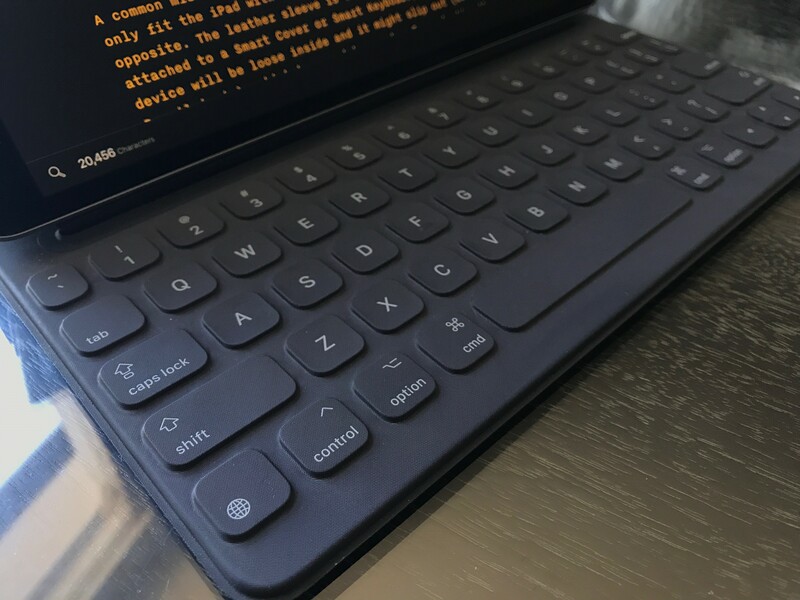 I wrote and edited this entire article on the Smart Keyboard for the 10.5” iPad Pro, and I didn’t run into any issues. 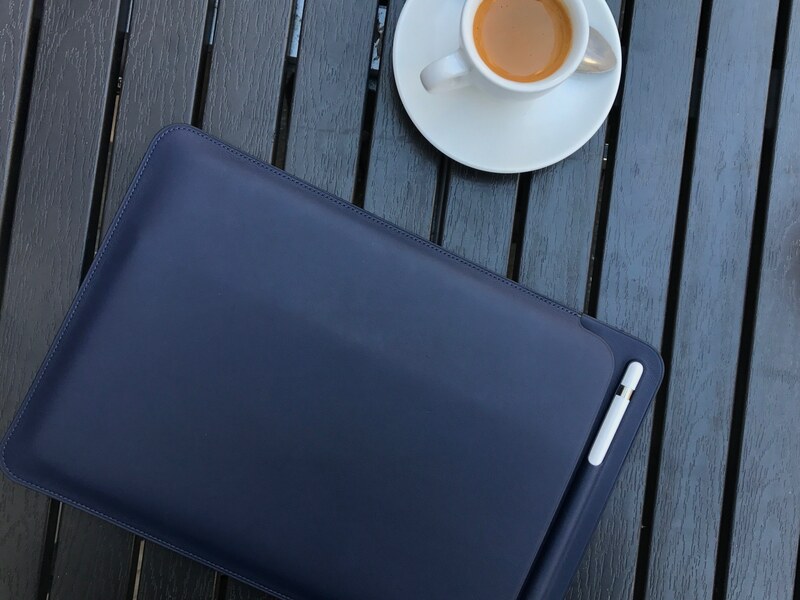 The new iPad Pro leather sleeve. The leather sleeve is an interesting idea. Apple gave me a Midnight Blue model that I’ve been using to carry the iPad, Smart Keyboard, and the Pencil together instead of having to place the Pencil in a Belkin case I purchased a few months ago. 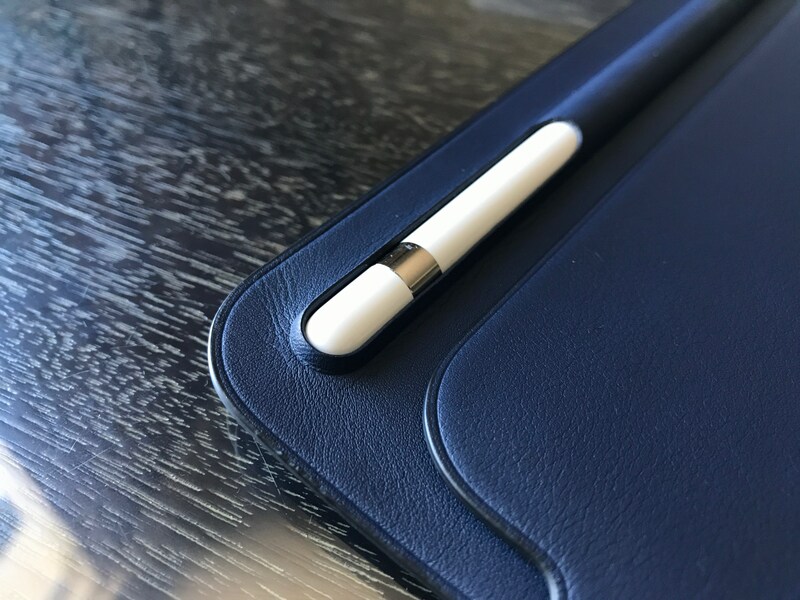 The Pencil can be placed into an inset at the top of the sleeve that protects the device and ensures it doesn’t fall off, while the iPad goes inside the sleeve that has leather on the top and microfiber lining at the bottom, where the back of the iPad is supposed to rest. To me, it feels like good quality leather and there’s even an etched Apple logo in the back; of course, I can’t judge how the material will age over the next few months. Setting the Pencil in the leather sleeve. A common misconception about the leather sleeve is that it can only fit the iPad with no cover attached, but it’s actually the opposite. The leather sleeve is best used when the iPad is attached to a Smart Cover or Smart Keyboard; otherwise, the device will be loose and it might slip out (even when the Pencil is in), which happened to me when I was testing the iPad in the sleeve with no keyboard or cover attached to it. This leads me to believe that the leather sleeve is primarily targeted at users who keep the Smart Keyboard always on, have a Pencil, and move between offices and different locations on a daily basis for presentations, on-site interviews, and other mobile tasks. If used this way, the leather sleeve is an elegant all-in one accessory. I’ve found myself frequently using it during the week of WWDC to hold the iPad and its accessories together in my bag without having to store them separately. I’m going to buy a black leather sleeve for every iPad we own in our household – it looks nice, and it fixes a common problem with an attractive solution. Below, I’ve included some additional comments and answers to questions I was asked while testing the 10.5” iPad Pro over the past week. It supports fast charging and USB 3.0 transfer speeds. The new iPad Pro comes with the same fast charging feature of the original 12.9” iPad Pro, and it packs a USB 3.0 controller in the Lightning port that allows for faster data transfers with external storage units and desktop computers. I bet fast charging will propagate to every portable Apple device. It comes with a 12W adapter in the box. Alas, if you want to take advantage of fast charging, you’ll still have to buy a 29W USB-C adapter separately. It has a headphone jack. As long as Apple finds room for a headphone jack in their non-iPhone devices, they’re going to offer one. This makes the transition to wireless audio smoother for everyone, particularly pro iPad users who rely on external audio interfaces and music apps. How many apps can you fit in its dock running iOS 11? Right now (beta 1 of iOS 11), same as the 9.7” iPad Pro: 13 user-added apps, plus up to 3 Siri proactive suggestions for a total of 16 app icons in the iOS 11 dock. Can you use an old Smart Cover with it? You can attach a 9.7” Smart Cover to the 10.5” iPad, but it’ll be loose and it won’t cover the entire front of the device. You’ll have to buy a new Smart Cover and Smart Keyboard for this iPad. Pro specs. According to GeekBench, the 10.5” iPad Pro has 4 GB of RAM; the previous 9.7” iPad Pro had only 2 GB of RAM. This could enable more powerful iOS 11 multitasking features that won’t be available to the first-generation small iPad Pro. It’s not difficult to reach a verdict on the new iPad Pro. 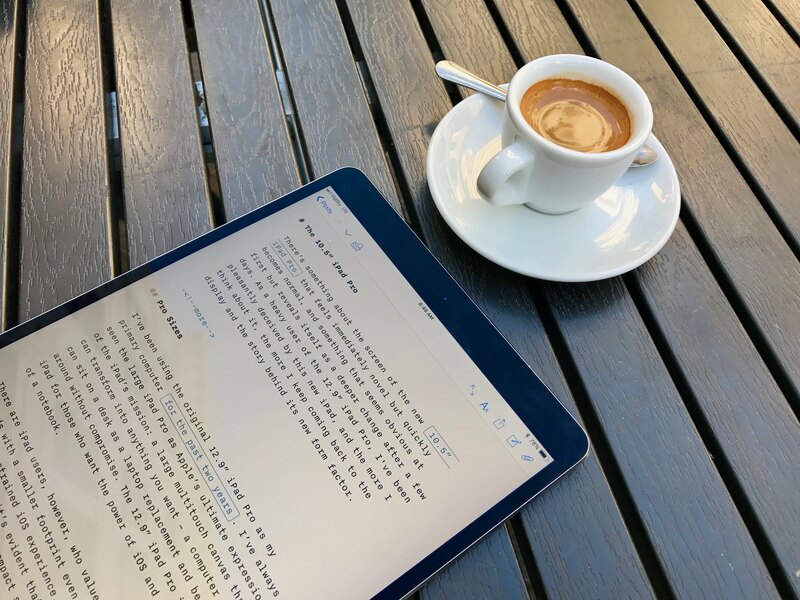 If you‘ve used the 9.7” iPad Pro for work every day and want the absolute best in preparation for iOS 11 later this year, you should get the 10.5” iPad Pro. Everything about this iPad is nicer, faster, and a bit more spacious than before to justify the upgrade. If you demand the best from your iPad, this is the new best you can buy. The conclusion is different if you, like me, have preferred the 12.9” iPad Pro as a large workstation for the past two years. Even if it’s bigger than the 9.7”, the 10.5” iPad Pro can’t compete with its larger counterpart when it comes to Split View and the sheer amount of content displayed on screen. I’m not going to give up my 12.9” iPad Pro for writing articles, doing research, and working with Split View to move data between multiple apps. If you like the best and largest expression of iOS, I recommend getting the new 12.9” iPad Pro. Personally, after a week of usage, I’ve appreciated the 10.5” form factor and new display so much, I’ve ended up somewhere in the middle. The 10.5” iPad Pro feels great to hold with one hand when catching up on Twitter, reading articles saved in Safari, and putting together advanced automations in Workflow. I’ve missed this kind of portability from the 12.9” iPad Pro, and I‘ve enjoyed having a smaller companion to more comfortably work on planes, in the car, or around the house. Plus, the screen is incredible. I’m not sure if I’ll end up using multiple iPads in the near future, but I know this: the 10.5” iPad Pro is the nicest, most powerful iPad I’ve used to date.